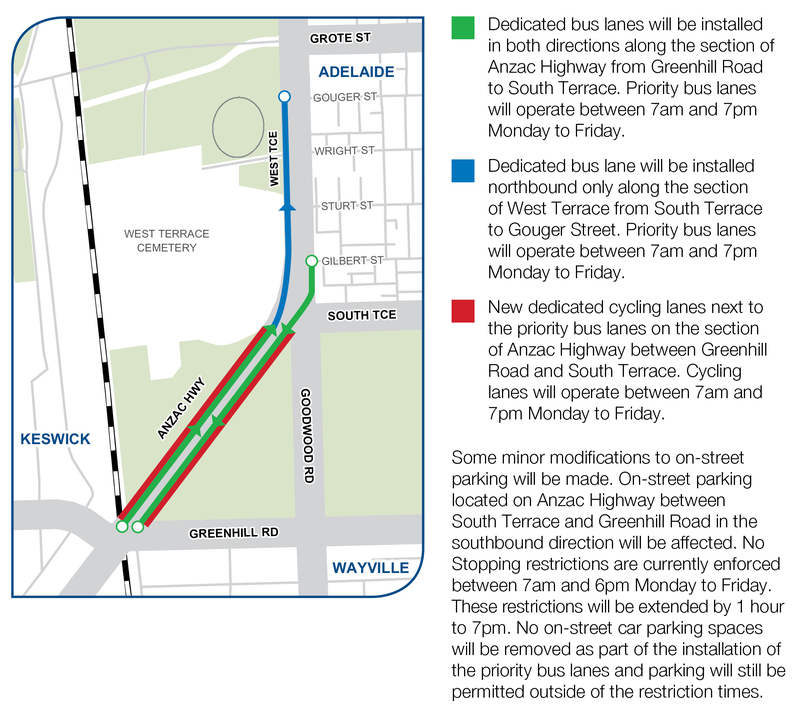 Priority bus lanes have been installed on Anzac Highway, West Terrace, Grenfell and Currie Street in Adelaide's CBD to make it easier for Adelaide's bus services to travel in and out of the city. The additional priority lanes operate between 7:00 am and 7:00 pm Monday to Friday. On-time running data on bus information for buses travelling to and from the eastern and western suburbs, the Hills and the O'Bahn has already improved since the implementation of the lanes. Taxis, cyclists and emergency vehicles are permitted to travel in the lanes to improve the effectiveness of all transport services in the city. The maximum distance you may drive in the bus lane is 100 metres (as well as entering or leaving a road, overtaking another vehicle, making a U-turn or avoiding an obstruction). Penalty for not adhering to the rules is $254 (plus the Victims of Crime levy).